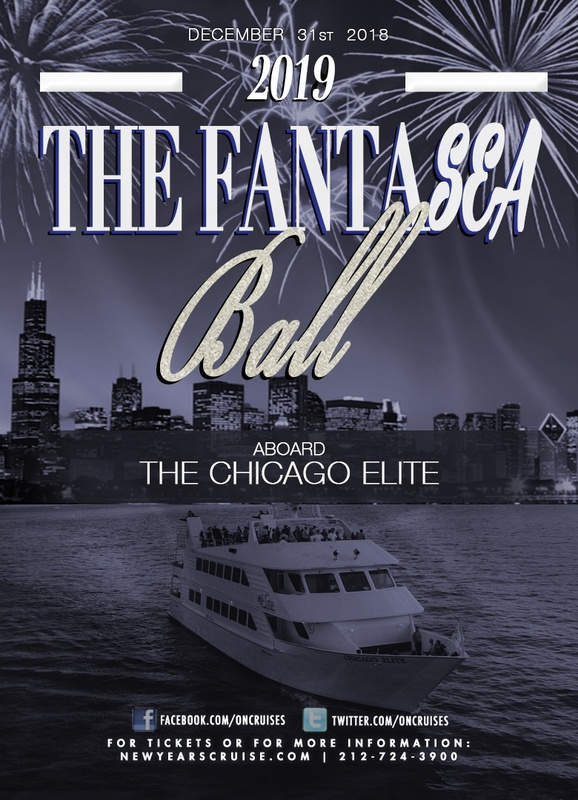 Welcome to the FantaSEA Ball Aboard the Chicago Elite. • Reserved shared table seating. Depending on your group size, you may be seated with other guests. Get ready to celebrate your New Year’s Eve in Chicago with cruise experience that will be like no other. Bring in the New Year aboard the luxurious Chicago Elite yacht and set sail with your friends on Lake Michigan. Party the night away on this great yacht as you enjoy the hits of the year and drinks all night. Leave 2018 behind with a view of the Navy Pier New Year’s fireworks and enjoy our unforgettable Chicago New Year’s cruise! Book your tickets today and set sail with us for an amazing night out to celebrate the New Year. Your New Year’s Eve celebration aboard the Chicago Elite yacht is going to be an experience like no other. This Chicago New Year’s cruise will have a live DJ onboard mixing up the hits of the year. Enjoy your favorite Top 40, Pop, Dance, and Hip-Hop hits while you dance the night away on any of the decks of the Chicago Elite. The Chicago Elite has three decks for you to enjoy. Two of the decks are fully enclosed and climate-controlled with windows all around the interior while the third deck is an outside observation deck. Take a step onto the outer deck and enjoy breathtaking views of Chicago as you sail. Enjoy the views of the Chicago skyline, Lake Michigan, the Navy Pier, the Sears Tower and more! While you enjoy the views from this Chicago New Year’s cruise, there will also be a full dinner buffet available. Enjoy your last meal of 2018 on the seas and fill up your plate with many delicious dishes. Prosciutto-topped chicken breast, spinach ravioli, and roasted vegetables are just some of the dishes being served for the night! Get ready to enjoy your favorite drinks with dinner and keep your glasses filled with your four-hour platinum open bar. Hit up the bars onboard and keep your favorite drink pouring all night, as you get ready to enter 2019. This Chicago New Year’s cruise will end off the year with a champagne toast at midnight as you watch the Navy Pier New Year’s fireworks fill the night sky! There’s only one way for you to end off 2018 in Chicago and that’s aboard the Chicago Elite Yacht!